This is a custom hair extensions business branding design package includes a Logo design with 1,000 high quality matching business cards printed and shipped to you within 7 days - FREE shipping. ►An elegant logo can leave a lasting impression on your clients, friends and guests. Show off your professionalism with our unique logo. ✔ High resolution JPG format. ✔ High resolution PNG format (on transparent background to paste it on any background color). 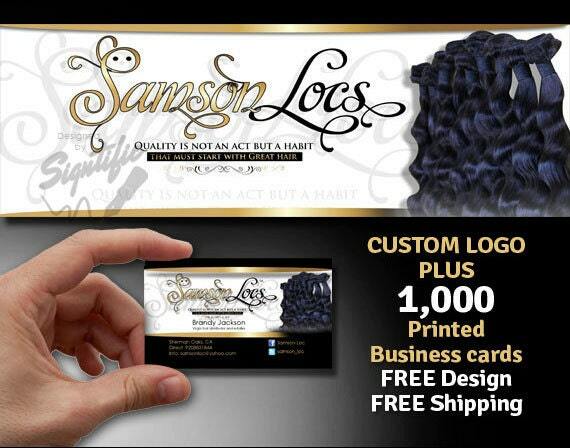 ✔ 1,000 high quality matching business cards printed and shipped to you in 7 days. ✔ 16 pt Premium Matte or Gloss. ** All the business branding packages that include business card printing are offered to US customers ONLY with free shipping, We do not offer international shipping at this time. Hair Extensions Business Branding, Logo Plus 1000 Printed Business Cards, Free Design, Free Shipping Business Cards, High Quality Cards.